Next Home are delighted to bring to the market this immaculately presented and spacious 4 BEDROOM DETACHED FAMILY VILLA situated in the highly desirable town of Auchterarder. The property was built by Stephen Gardiner Construction in 2015. The generous accommodation is split over two floors and comprises: entrance hall, bright and spacious lounge, open plan dining kitchen, garden room, utility room with access to the integral single garage, and W.C./cloakroom on the ground floor together with four double bedrooms (master of which is en-suite) and a modern family bathroom on the upper level. 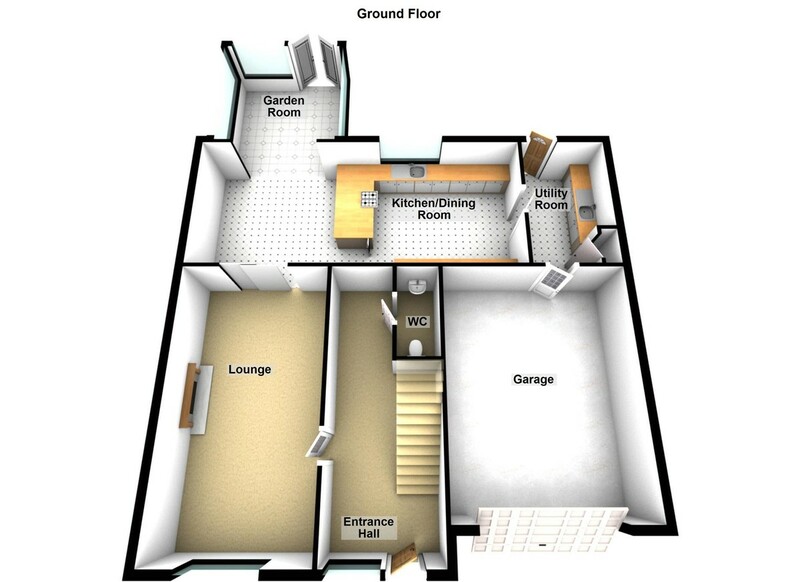 There is under floor heating on the lower level together with gas central heating and radiators on the upper level. Double glazed throughout. EPC RATING B. The property benefits from areas of garden ground to the front and rear together with ample off street parking in the form of a mono blocked driveway leading thereon to an integral single garage. Early viewing is highly recommended as this property is a perfect family home and is sure to appeal to a range of prospective purchasers. ENTRANCE HALL 20' 11" x 7' 7" (6.38m x 2.31m) Entered via a wooden front door with adjacent glass panels, the entrance hall gives access to all accommodation on the ground floor level. Under stair storage cupboard. Karndean flooring. Under floor heating. LOUNGE 19' 8" x 11' 3" (5.99m x 3.43m) A very bright and spacious public room with window to the front. Gas feature fireplace with display shelving to the sides. Ample space for a range of free standing furniture. Carpet. Radiator. Sliding double doors give access to the dining kitchen. KITCHEN 15' 8" x 10' 9" (4.78m x 3.28m) Fitted with a range of modern high gloss wall and base units with Quartz worktops and up stands. Integrated stainless steel sink, five ring gas hob with extractor over, oven, grill, dishwasher and fridge/freezer. Window to the side. Karndean flooring. DINING AREA 10' 9" x 10' 7" (3.28m x 3.23m) Open plan to the kitchen and garden room. There is space for a large set of dining furniture. Karndean flooring. GARDEN ROOM 11' 2" x 10' 1" (3.4m x 3.07m) An attractive addition to the property with lovely views over the garden and the surrounding hills. Space for a range of free standing furniture. UTILITY ROOM 10' 11" x 6' 10" (3.33m x 2.08m) Fitted with a range of white, high gloss wall and base units with granite effect work surfaces and up stands. Space for a washing machine and tumble dryer. Integrated stainless steel sink. Door to the rear provides access to the garden. Access to the integral garage. Built in cupboard. Karndean flooring. W.C./CLOAKROOM 7' 6" x 3' 7" (2.29m x 1.09m) Fitted with a modern suite comprising: W.C. with concealed cistern and wash hand basin with decorative tiling to the walls and Amtico flooring. Chrome heated ladder towel rail. Extractor fan. GALLERIED LANDING 21' 0" x 12' 6" (6.4m x 3.81m) A carpeted staircase gives access to the first floor landing and thereon to all accommodation on the upper level. Built in cupboard. Hatch providing access to the loft space above. Large linen cupboard. Neutral décor. Velux window to the front. BEDROOM 1 13' 10" x 11' 2" (4.22m x 3.4m) A generous sized double bedroom with window to the rear. Double built in wardrobe with hanging rail and shelving. Ample space for a range of free standing bedroom furniture. Carpet. Radiator. Access to the en-suite. EN-SUITE 11' 2" x 5' 10" (3.4m x 1.78m) Fitted with a modern suite comprising: W.C. with concealed cistern, large floating wash hand basin with storage drawer under and vanity mirror over, together with a double walk-in shower cubicle with glass screen. An opaque glazed window to the side provides additional light and ventilation. Tiling to the splash back areas and complementary Amtico flooring. Heated towel rail. Extractor fan. BEDROOM 2 11' 11" x 10' 9" (3.63m x 3.28m) Another good sized double bedroom with window to the rear. Built in wardrobe with hanging rail and shelving. Neutral décor. Carpet. Radiator. BEDROOM 3 11' 5" x 11' 5" (3.48m x 3.48m) A double bedroom overlooking the front of the house. Neutral décor. Built in wardrobe with hanging rail and shelving. Carpet. 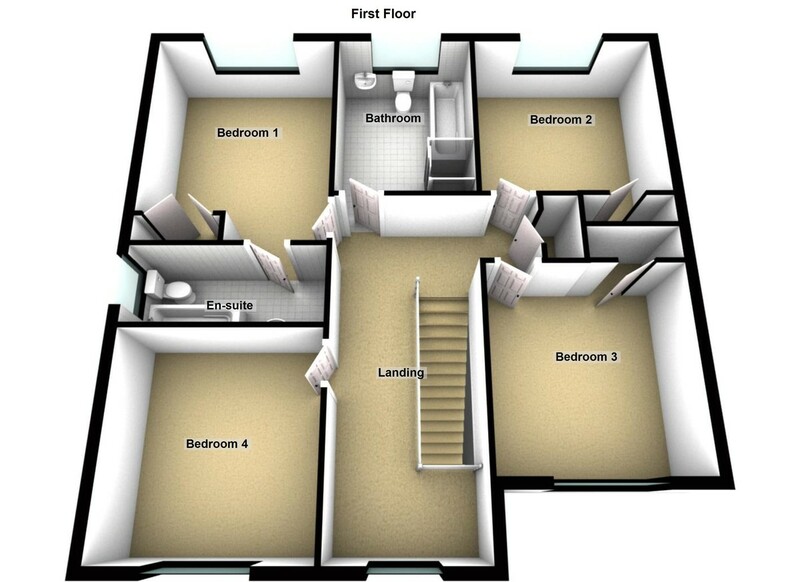 BEDROOM 4 11' 4" x 10' 4" (3.45m x 3.15m) A further double bedroom with window overlooking the front of the house. Neutral décor. Carpet. BATHROOM 10' 8" x 7' 1" (3.25m x 2.16m) Fitted with a modern white suite comprising: W.C. with concealed cistern, wash hand basin with vanity mirror over and bath with shower attachment, together with a separate large shower cubicle with decorative tiling to the splash back area. Tiling to the walls and complementary Amtico flooring. An opaque glazed window to the rear provides additional light and ventilation. Chrome ladder heated towel rail. Extractor fan. GARAGE Large single internal garage with powered door. Cupboard with electricity meter and CAT 5 cabling board. EXTERNAL Externally the property benefits from an ample amount of off street parking by way of mono blocked driveway which leads onto an integral single garage together with lanscaped areas of garden ground to the front and rear. To the front the garden is predominantly laid to lawn. To the rear the garden is fully enclosed with timber fencing and is predominantly laid to lawn with planted borders. The rear also benefits from a paved patio area which makes an ideal haven for relaxation and socialising during the summer months. External power sockets to front and rear of house. Garden shed.